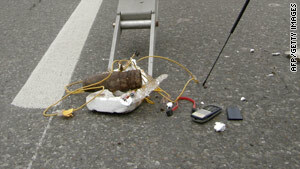 The Iraqi military displays a car bomb built to be triggered by a cell phone in Baghdad on Wednesday. The two deadliest attacks Thursday were in the towns of Iskandariya and Yousifiya, south of Baghdad, an Interior Ministry official said. Two bombs detonated in quick succession about 11 a.m. at a busy marketplace in Iskandariya, killing at least two people and wounding 28 others, including children, the official said. Iskandariya, part of Babil province, is about 25 miles (40 kilometers) south of Baghdad. In the second attack, a parked car bomb exploded at a taxi and bus stop in Yousifiya. The blast killed at least two people and wounded 10 others, the official said. As Iraqis prepare to celebrate the Muslim holiday of Eid al-Adha, public places like markets are packed with shoppers. In Baghdad, three bombs attached to civilian vehicles caused casualties. One of the bombs detonated on a highway in eastern Baghdad, killing the driver in the car and wounding two civilian bystanders. In southwestern Baghdad's Saydiya neighborhood, an Iraqi was killed and three others were wounded when a bomb attached to a civilian vehicle detonated. In northern Baghdad, a driver was wounded when a bomb attached to his vehicle exploded.